If it's your first time being a parent, you are currently in awe of how fast time is flying and how many milestones are coming and going. Even my second time around with a newborn, I found myself unable to comprehend how my little babe was now sitting and eating food. 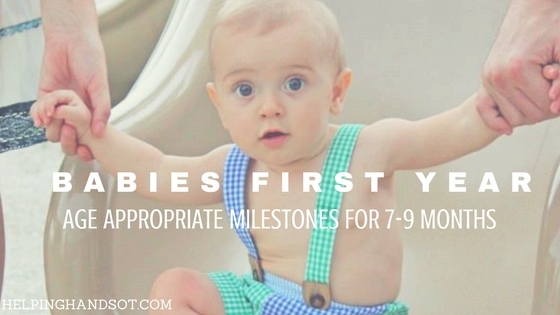 The 7-9 month age bracket is a B I G milestone development time frame, especially when it comes to gross motor skills. Then again, when is there NOT a lot of milestones happening when it comes to raising children?! So prepare yourself to say goodbye to your easy immobile baby and brace yourself for a motivated mover! It doesn't stop at just crawling either -get ready for pulling to stand on furniture and independent sitting! I think it's safe to say this would be a good time to baby proof! This guideline has been developed through clinical experience and in combination with references Peabody Developmental Motor Scales 2 + The Beery VMI. Reminder: Focus on your child’s strengths, not weaknesses. Focus on if your child is making an overall forward progression instead of making sure your child makes EVERY milestone according to plan (you can easily drive yourself and your baby crazy.). Relax and enjoy these fleeting moments! Now that the ATNR reflex has integrated (gone away), your baby is ready to learn to crawl. Don't force it if they are not ready, let it happen naturally! Baby lifts up into quadruped (hands and knees) and rocks back and forth. Baby lifts into quadruped position and reaches for a toy with one hand while weightbearing on the other hand. As funny as it may sound, a baby typically begins to crawl backwards before they learn to propel themselves forward purposefully to obtain an object. And usually, they begin to belly crawl or scoot before they learn to push up into the hands and knees position for actual crawling. So if your baby is currently going backwards, don't worry, this is a normal progression of crawling. Crawling Tip: Grass, sand and other fun textures are good places for a baby to learn to crawl because the added texture provides more tactile and proprioceptive input to the hands and knees, giving the brain and body a better awareness of his/her position in space. Now that your baby has less reflexive actions going on to get in the way (such as fisted hands and ATNR reflex), they being to learn how to use their hands effectively to manipulate their environment and obtain what they want. 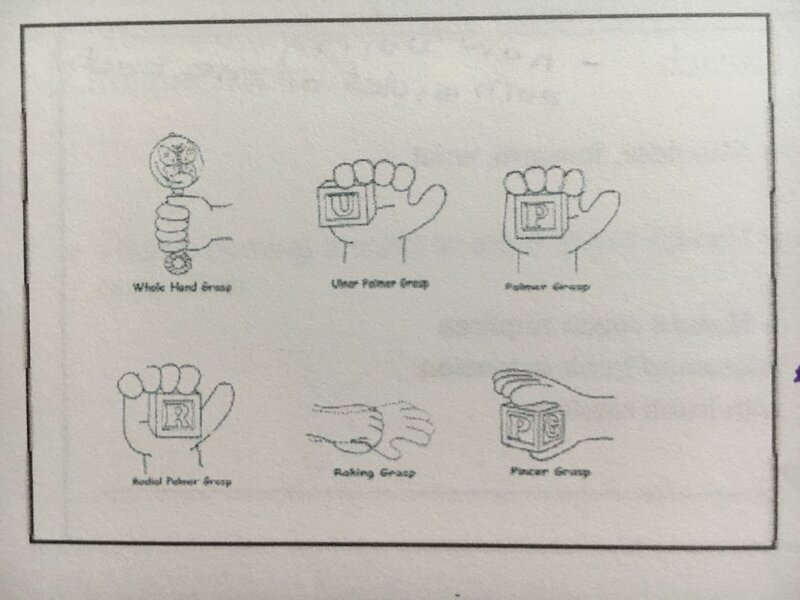 The development of grasp begins with more immature grasping patterns such as raking and using a whole fist to grab an object, and then refines into a more mature grasping pattern, what we call a pincer grasp. A mature pincer grasp is when the thumb is opposed to the tip of the index finger with a space in the palm/webspace. It is normal for baby to initially begin grabbing objects with the pinky side of the hand (ulnar palmar grasp) and then fingers against the palm (palmar and radial palmar grasps) before becoming proficient at a refined pincer grasp. While you may think it is too early to begin teaching your child to care for themselves, there are activities you can begin introducing early on to help your child feel more independent and confident in themselves. **Dont worry if your baby shows signs of anything above ONE or even a few times! Only if a consistent pattern is noticed in a certain area should you feel the need to be concerned. What I’m trying to say again here is, don’t make a mountain out of a molehill!